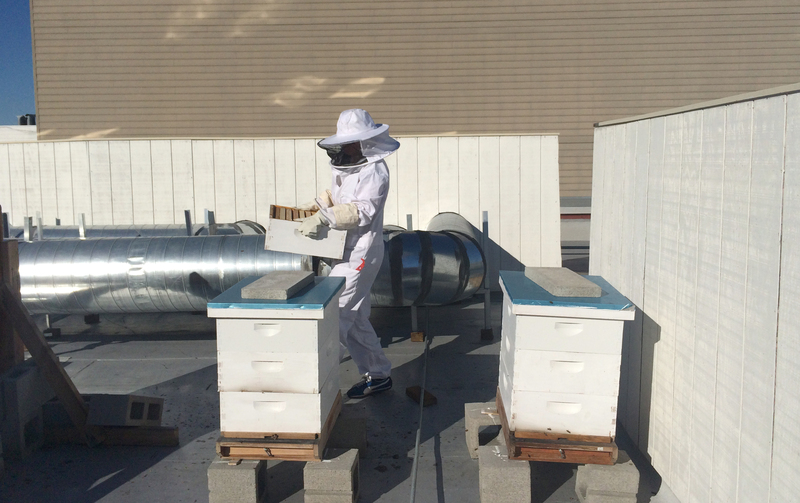 We have recently visited the hive just last week and everything seems to be going well as the weather is getting cooler, and wetter, in San Francisco. Hive No. 1 is still thriving but beginning to cull its numbers in preparation for the winter. Hive No. 2 is limping along. We think the young queen isn’t as hearty as we would have liked. Fingers crossed they make it through the winter. Next steps—brush up on how best to winter our hives. Having lost our bees last winter we want to make sure we don’t repeat any mistakes. If anyone has any keen wintering advice for us, please let us know! This is what the hive looked like after we finished putting it back together. 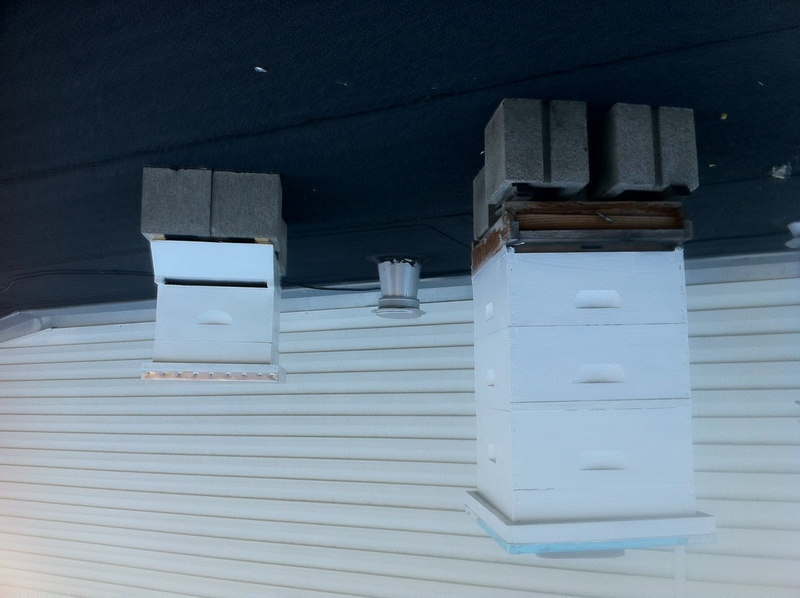 Having inspected 4 Supers and a Top Feeder, you can see that the bees were not simply hanging out inside, but rather, all over the hive, trying to find their way back in, figure out what was going on, and also be ready to protect against further invasion! It’s amazing how much I don’t know about bees. 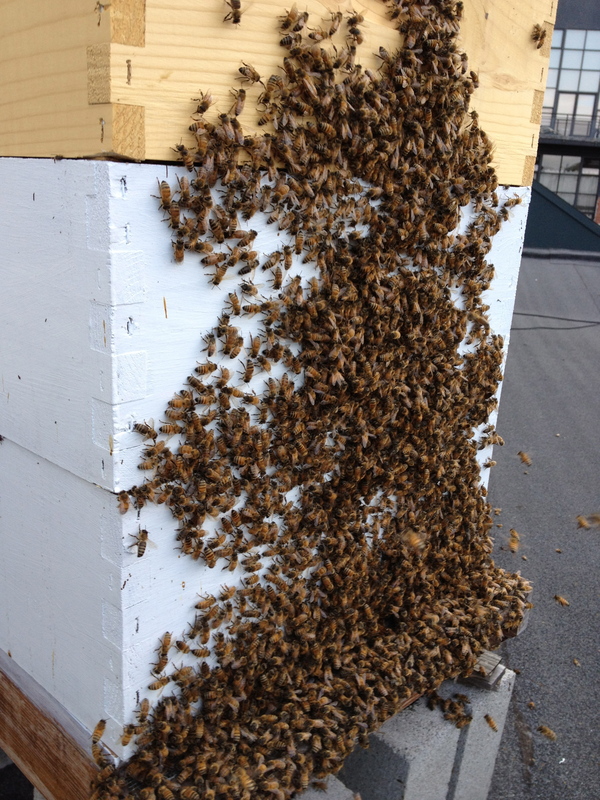 As I mentioned yesterday, we had our first swarm. So, today was the “get in the hive and figure out what’s left, what might have gone wrong, and what’s next” visit. I was so nervous and unsure of next steps that I invited Brian from Her Majesty’s Bees to come along for the visit today. He graciously accepted. I think he can recognize an overwhelmed drowning beekeeper when he sees one. Evidently step one for Brian when visiting 30,000 bees in their hive is for him to take his shirt off?! What?!?! Yes, that’s correct. As he explains it, bees like to find the dark places, so when he wears his shirt, they end up in the sleeves and he gets stung, but by contrast, they don’t seem nearly as interested in stinging Brian when he has his super white flesh exposed! I was impressed. Of course, once Brian established that not only was he not going to wear any protective gear, but in fact he was going to remove his shirt, I was left with little recourse but to remove mine. Just kidding. I kept my shirt on, and instead buttoned the top button at my neck. Inspired by the absolute confidence of Brian, I acted cool and didn’t even suggest I should wear my gloves or my suit. Usually Cam and I smoke the bees to calm them down. We also usually wear full suits and gloves. This visit was different. No gloves, no smoke, no suit, just human vs. bees au naturale’. I didn’t even know you could do that! Brian removed the top super which was 100% filled with honey and he stood it on its side. This was a great move because it kept the asphalt from the roof from getting on the frames. It also was beneficial in allowing us to scrape the excess comb on the top or bottoms of the frames. That is the queen excluder leaning on the side of the super. Brian opened the hive and let out a gasp. Cam and I were exposed for the laissez faire beekeeping approach. We had not been properly cleaning the excess comb, and the bees, in desperation to make advantage of every empty space, had started building comb in numerous places they shouldn’t otherwise have built. Brian realized this wasn’t going to be a quick visit as he had hoped. He conscientiously set to work scraping the excess comb away, instructing me to do the same. Now at this point you should realize we’ve just opened the hive and there are an impressive number of bees in there, probably north of 30,000 by our best guess. We haven’t smoked them, I have no protection, and the only thing allowing me to breath is the absolute calm that Brian exudes. At one point I must have had 50 bees landed on me, in my hair, and on my clothing. I took a deep breath, didn’t move, and they all went away without a sting. 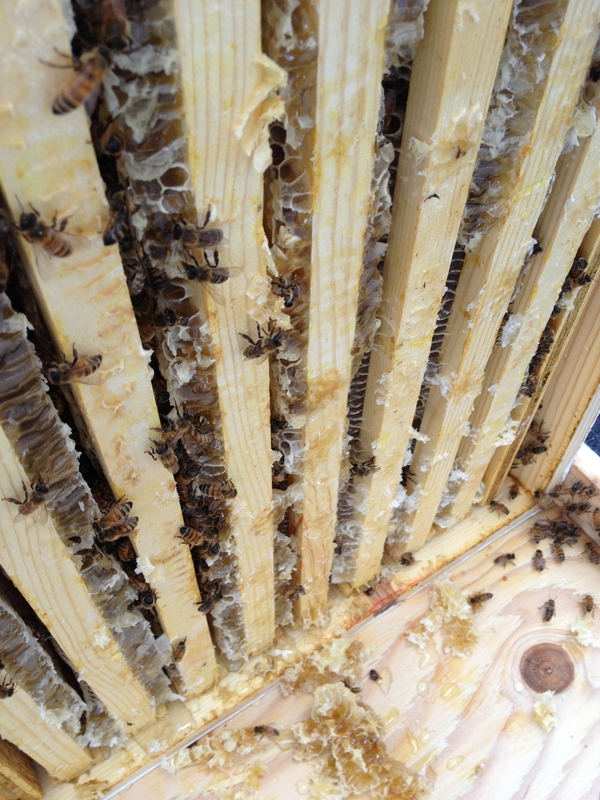 I spent the next hour with Brian cleaning the frames to get the hive back to more ideal clean conditions. 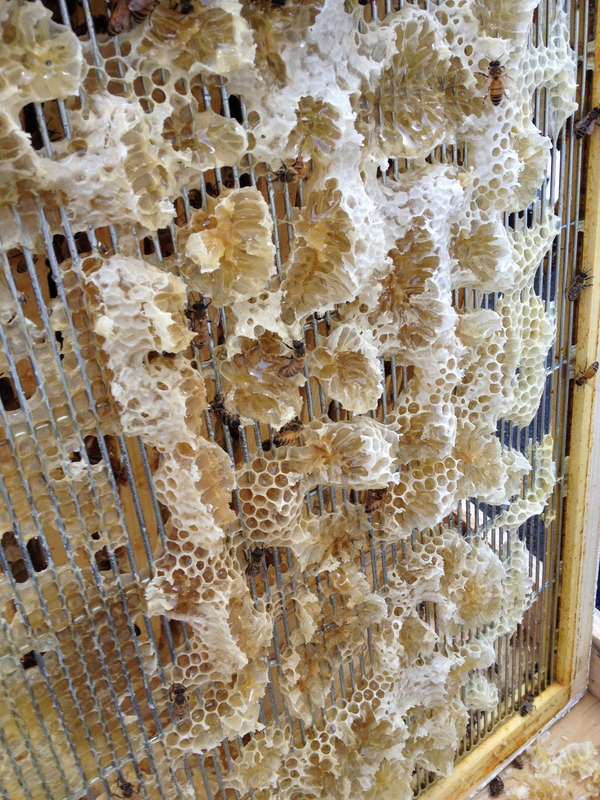 This is a close up of the super that was filled with honey. I scraped all the excess comb off the top of the frames, and then we placed the super back in the stack. Great trick to stand it vertically! The queen excluder, overbuilt with comb and honey dripping everywhere. We had to scrape this clean, but the thing is, if we dent or tweak any of the wires, the excluder will be ruined. The difference between a queen being able to fit through the wire and not is microscopic, so any dent mean unrecoverable uselessness. I hope I didn’t screw this up!? So, we cleaned up the frames, put all the extra honey we scraped off in a top feeder so that the bees can re-claim all their hard work, stacked the supers back, added a new (empty) super, and left the hive alone. Brian said likely somewhere in the bottom super the new queen cell has hatched, and he recommended that we give her two weeks to build her strength, take a few mating flights, and start to lay eggs. Then we should get into the hive and inspect her brood pattern to make sure she is a strong queen at which point we make the call to let her continue as queen, or, if she looks weak, we can consider replacing her with another queen that we would buy from the store. This is scary, crazy stuff, but exciting as we break down the barriers of experience and knowledge. The last 48 hours have been awe inspiring and stressful. The journey continues. p.s. In case you are wondering, Cam has been on vacation this entire time at Lake Tahoe! 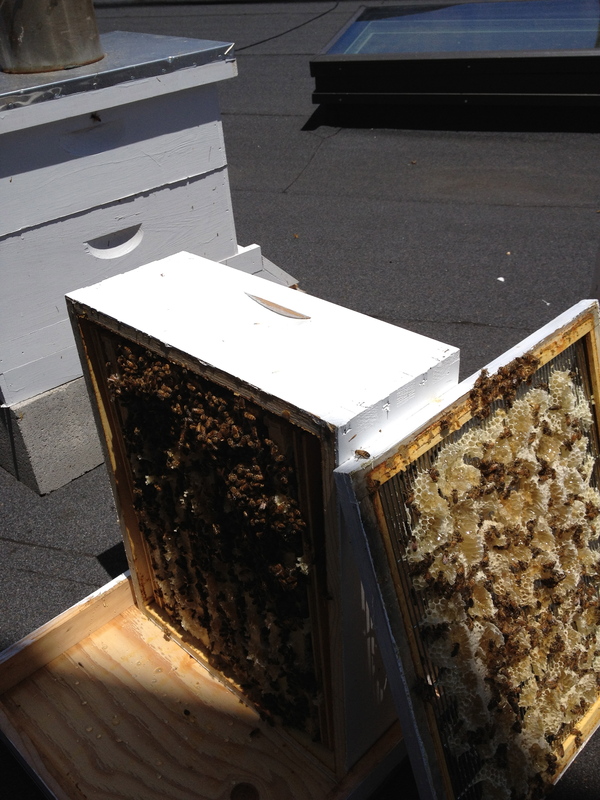 The second hive is on the roof. Just awaiting the queen and her hive.